2Blackett Laboratory, Department of Physics, Imperial College, London, UK. The enormous speed of light allows us to observe distant galaxies and to communicate in real time at remote points on the surface of the earth. At smaller frequencies, light passes through macroscopic solid objects almost completely unhindered, interacting weakly with matter. Reducing its velocity down to zero is of fundamental scientific interest [1-3] that could usher in a host of important photonic applications, some of which are hitherto fundamentally inaccessible. These include cavity-free, low-threshold nanolasers [4,5], novel solar-cell designs for efficient harvesting of light [6,7], nanoscale quantum information processing , as well as enhanced biomolecular sensing . Until now complete stopping of light pulses, leading to their localisation in a specific region of space, in solid structures and at ambient conditions, has been hampered by fundamental difficulties. Ultraslow light requires strong group-index (ng) resonances but the increased (compared with gases) damping at normal conditions invariably broadens and weakens such resonances. Certain resourceful schemes, such as electromagnetically induced transparency (EIT) , can exploit very narrow absorption dips arising from quantum interference effects to drastically slow-down light in ultracold atoms (where damping is minimised) but their solid-state implementations [11,12] usually decelerate light by up to a factor of a few hundreds. Furthermore, at the zero-group-velocity (zero-υg) point of an EIT scheme a light pulse usually relinquishes its photonic character by coherently mapping its optical quantum states to stationary electronic (spin) excitations . Light is 'stored' in this way  but our ultimate goal of observing and harnessing photons at a zero-υg point is not satisfied ‒ even under extreme conditions entailing vacuum operation and ultralow temperatures. Periodic nanophotonic structures offer another route for slowing-down light, essentially via periodic back-reflections by a lattice of scatterers having sizes comparable to the wavelength . Here, it is structural disorder that fundamentally limits the attainment of light stopping. Tiny nanometer-scale fluctuations destroy the (theoretically assumed) 'perfect' periodicity, leading to a 'smearing out' effect in the attained group indices at the band edges [16,17]. Practically this results in slowing-down factors that normally do not exceed a few hundreds. Here we report on a solid-state configuration leveraging media with negative electromagnetic parameters [18,19] whereby an arbitrary number of light pulses can be stopped, remaining well localised ‒ without diffusing ‒ at predefined spatial locations despite the absence of any barriers in front or behind the pulses. Our work addresses two fundamental problems: First, how the detrimental role of decoherence mechanisms (losses and surface roughness) in the light-stopping ability of a solid-state nanophotonic structure can be overcome; and, second, how light stopping can be accomplished without overshooting the optical losses at the zero-υg point. The lifetime of the stopped light pulses in our nanoplasmonic structure (Fig.1) decreases only moderately (by a factor of ~ 1.5) compared with the normal (ng ≤ 10) nanoplasmonic light regime, allowing for a broad range of applications in this field. Further, we present a realistic design and computational demonstration of a negative-refractive-index optical metamaterial in the fabric of which we insert a (four-level) gain medium (laser dyes), such that the metamaterial enters the full lasing regime. We, thus, demonstrate an ultra-thin, ultra-fast nanolaser, operating at visible wavelengths (710 nm) and with modulation bandwidth close to 1 THz ‒ orders of magnitude faster than typical modulation speeds of conventional lasers. We have identified two light-stopping structures: The first is made of a negative-refractive-index core layer surrounded by air (illustrated schematically in Fig. 1), while the second is made of a Si layer sandwiched by two (plasmonic) ITO layers (see Fig. 1) . While the negative-index structure clearly showed how we may access the zero group-velocity (zero-υg) points, it was still found to be incomplete in the following respects: First, the (negative) effective refractive index of the metamaterial slab may exhibit fluctuations, even at microwave frequencies where homogenization works best. Second, the group-velocity dispersion at the zero-υg point should be minimised to avoid late-time broadening (diffusion) of the stopped pulses. Third, the configuration should also be immune to the presence of surface roughness. Figure 1: Schematic illustration of the two configurations used for obtaining complex-ω stopping of light. The first is an air/metamaterial/air slab heterostructure, with the middle metamaterial layer (yellow) having a negative refractive index at microwave wavelengths. An upper prism (not shown here) is used to in-couple spatially separated incident light beams (white) into the middle layer, exciting the complex-ω mode at its zero-υg point at different spatial locations along the waveguide. Rather than being guided along the structure, the excited pulses (in colors) remain stopped, decaying with time at their injection points. 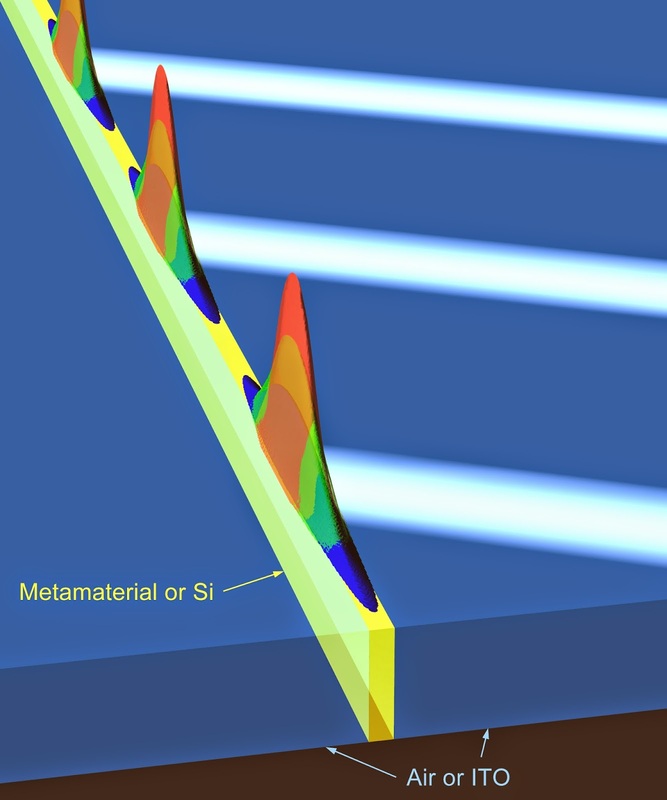 The second structure, operating at telecommunication wavelengths, is made of a Si slab bounded by two ITO layers, with the upper one (right) having a finite thickness. Here, the complex-ω mode is weakly leaky at its zero-υg point and, hence, there is no need to use a prism. The complex-ω pulses in this structure remain stopped and strongly localised, without diffusing and broadening at late times. A structure that manages to comply with the above requirements, exhibiting complete and dispersion-free stopping of light pulses, is reported in Fig. 1 (schematically) and Figs. 2(b)-(d). We used a silicon slab of thickness 290 nm, bounded by a low-loss plasmonic material (indium tin oxide, ITO). The upper ITO cladding layer, through which the injection of the light pulses into the middle Si layer was performed, had a finite thickness of 500 nm. 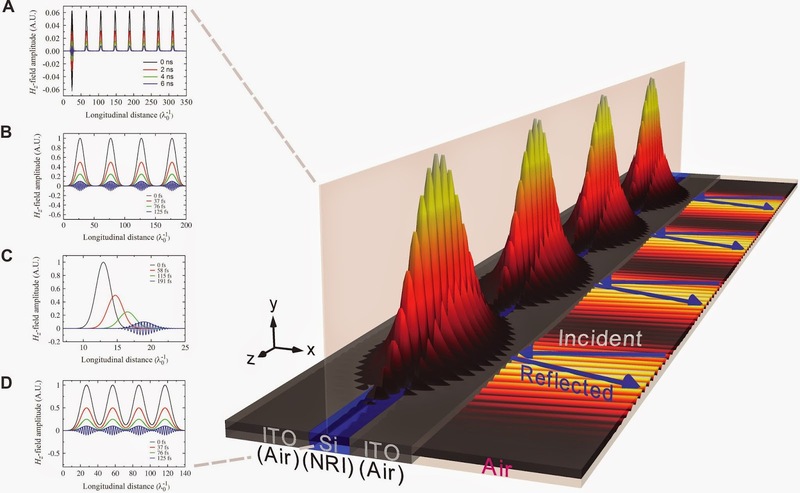 At near-infrared wavelengths (1.55 µm) and for p-polarized light the (real part of the) permittivity ε of the ITO layers is negative , thereby providing the required light-deceleration and stopping mechanism ‒ similarly to the negative-index structure . We expect that in the β = 0 (quasistatic) region the bands of the supported modes become flat (υg = 0) ; therefore, to minimise group-velocity dispersion and to make the desired band as flat as possible at a finite-β zero-υg point, this point must be brought as close as possible to the β = 0 region. Indeed, we have designed the above ITO/Si/ITO heterostructure such that it accomplishes this goal, supporting a bulk complex-ω mode [20,24] with a zero-υg point on the right-hand side of the air light-line. In addition to low group-velocity dispersion and preservation of the light-stopping point (in the presence of losses), this weakly leaky mode features two further favourable characteristics: First, since β was designed to be finite but small at the zero-υg point, the effective index neff = β/k0 of the mode therein turns out to be smaller than unity: neff = 0.39 < 1. Consequently, the wavelength λeff inside the structure became larger than the free-space one (λ0 = 1.55 µm), which further diminished the effect of nm-scale surface roughness. Second, since the mode at the zero-υg point is (weakly) leaky there was no need to use a prism to excite it from air, thereby considerably alleviating the realisation of the scheme. Figure 2(b) illustrates the time-evolution of four light pulses evanescently coupled into the above plasmonic heterostructure. The incident free-space wavelength was λ0 = 1.55 µm (ω ≈ 1.2 PHz) and the angle of incidence was θ = 72.5o, both selected such that precisely the zero-υg point was hit. We see from Fig. 2(b) that the four light pulses are stopped and strongly localised, decaying with time, without propagating and broadening. The e-1-lifetime of each pulse, calculated by analytically solving the pertinent dispersion transcendental equation, was found to be 28.4 fs, while the time taken until the pulses are completely absorbed was approximately 131 fs, in agreement with the FDTD calculations of Fig. 2(b). When the angle of incidence of an exciting pulse is such that a non-zero-υg point is hit, a pulse injected into the heterostructure propagates away from its starting point, decaying but also dispersing (broadening) with time (Fig. 2(c)), as expected. Importantly, while the deceleration factor (group index) from the non-zero-υg point (ngB ≈ 6.6) to the zero-υg one (ngA → ∞) increases dramatically, the temporal losses increase by no more than a factor of two (from 2.4×1013 s-1 to 3.7×1013 s-1). This crucial aspect, together with the fact that the lifetimes at the stopping point (28.4 fs and 131 fs) are typical nanoplasmonic ones, suggests that a wealth of applications within this field should also be possible in the stopped-light regime. Note further from Fig. 2(b) that, since the herein observed localisation is not a cavity- or disorder-aided one, the optical pulses can be injected and stopped at any point along the structure, as well as be brought tighter together ‒ up to the diffraction limit. Figure 2: (To view higher resolution click on the image) Full-wave FDTD calculations of the time-evolution of one or more pulses injected inside the light-stopping configurations of Fig. 1. In all cases the results are recorded on the vertical yz plane (translucent) cutting through the middle layer. (a) Shown are eight pulses in-coupled into the negative-index heterostructure at its zero-υg point. All pulses remain stopped for more than 6 ns, decaying with time at their initial positions. (b) Shown here are four pulses in-coupled into the plasmonic heterostructure at its zero-υg point. The pulses remain stopped and localized, without broadening, for more than 130 fs. (c) When a zero-υg point is hit, the pulse in-coupled into the plasmonic structure moves away from its initial point, both decaying and broadening with time. (d) The pulses in 'b' can also be brought closer together ‒ up to the diffraction limit ‒ since the structure is completely uniform, and the localization is not aided by disorder or a cavity-like action. Finally, we have examined the effect of realistic levels of surface roughness on the light-stopping ability of the plasmonic heterostructure. To this end, we introduced random variations in the permittivities within a thin layer of ±1 nm around the two Si/ITO interfaces. We then recorded the time evolution of the centre of energy and full-width at half-maximum (FWHM) of a pulse in-coupled close to the complex-ω zero-υg point. We have found  that the presence of roughness does not destroy the localisation (stopping and absence of broadening), since both the centre of energy and the FWHM (perturbed by the random surface landscape) oscillate ‒ with a very small amplitude ‒ around the values they had in the absence of roughness. From these results, we measured a group index of ~ 1.5×107! Hence, although the pulses experience dissipative losses (from ITO), radiative losses (being weakly leaky) and surface roughness at the two Si/ITO interfaces, they remain robustly stopped and localised, with a movement of their center-of-energy being almost indiscernible. This robustness to nm-scale surface roughness arises from the fact that, unlike periodic structures, here the wavelength inside the structure at the zero-υg point is λeff = λ0/neff = 3974 nm ‒ thousands of times larger than the surface-roughness amplitude, and therefore essentially insensitive to it. The simplicity of the final design, together with the gigantic enhancement of the group refractive index and the minor increase of optical losses, make the structure appealing for a host of nanoplasmonic applications. Particularly, the enhancement of the density-of-states in the region around a flat band is a key parameter for enabling high-efficiency solar cells , as well as for giving rise to strong interactions between quantum emitters and plasmonic nanostructures  ‒ the cornerstone of strong optical nonlinearity. We anticipate that this might be extendable potentially even at the single-photon level, allowing for nonlinear quantum-optical logic operations on nanoscopic scales. Since the lifetime of our stopped-light excitations are of the order of 0.1 ps (owing to the presence of dissipative losses), we may use an optical gain medium to compensate for the losses. In general, the tight light localisation on truly nanoscopic dimensions ‒ well below the diffraction limit for visible light ‒ that nanoplasmonic metamaterials offer enhances the interaction of light with mater, paving the way for a multitude of classical and quantum nano-optics applications. However, metal optics suffers from inherent dissipative losses, which have persistently hampered many of the envisaged applications. We have recently shown that gain-enhanced nanoplasmonic metamaterials can overcome these hindrances and lead to novel nanophotonic components and devices. Dissipative losses in nanoplasmonics arise from the interaction of the incident photons with the quasi-free conduction electrons of the metals, thereby constituting a rather inherent feature of the responses of metal-based nano-devices. For truly subwavelength plasmonic structures these losses follow universal laws, i.e. they do not depend on the particular geometric configuration but only on the deployed (usually noble) metal. Typical damping rates are thus of the order of Γ ~ 100 ps-1, requiring gain coefficients Γ/c ~ 103 - 104 s-1 to compensate for the losses. Meanwhile, the extreme control of light in optical metamaterials paves the way towards nano-enabled functionalities right at the materials level. But these need to be controlled dynamically, on-demand and in real time. Both of the aforementioned challenges can be met by enhancing metamaterials with gain, incorporated right into their fabric. In the following, we briefly illustrate – on the basis of full-wave simulations – that high gain densities in a realistic nanoplasmonic metamaterial result in the compensation of, both, dissipative and radiative losses leading into the full lasing regime, where bright and dark lasing states dynamically compete giving rise to ultrafast nonlinear responses. Figure 3: Electric-field amplitude profiles and charge distributions on the metal films inside the double-fishnet unit cell for (a) the bright mode at λbright =717.25 nm and (b) the dark mode at λdark = 731.8 nm. The direction of the electric field in the x-z plane is indicated by the white arrows. (c) Total average energy density (black area) and frequency-filtered contributions at λpump = 680 nm (green dashed line), λbright (white full line) and λdark (yellow dash-dotted line). Figures 3(a) & (b) depict an example of an active (gain-enhanced) nanoplasmonic metamaterial comprised of two thin silver nanofilms, periodically perforated with holes, and laser dyes inserted between the films [4, 5]. The structure has been designed such that there is an optimum coupling of the plasmonic excitations to the gain molecules, ensuring efficient harnessing of the gain. An intense pump pulse of 2 ps duration (λpump = 680 nm) inverts the gain medium and dynamically creates a 3D occupation inversion profile closely matching the spatial distribution of the electric field at the probe wavelength (λprobe = 710 nm). After 7 ps, a weak broadband pulse of duration 12 fs probes the active structure, and its far-field spectrum is recorded at the two sides of the planar metamaterial. Detailed calculations have shown that in the regime of full loss compensation the real part of the effective refractive index of the nanostructure becomes more negative compared to the passive case. By prolonging the duration of the probe pulse such that the energy inside the nano-fishnet became constant with time, we have also ascertained that there can be net outflux of optical energy through a volume encompasing the metamaterial, i.e. there is more energy radiated away from the volume than energy incident on the volume. Hence, our quantum plasmonic amplifier can operate not only transiently but also in a steady-state mode. Such active nanostructures can function as powerful light sources, either coherent (nanolasers) or incoherent (diodes), delivering intense optical power within ultrasmall volumes or ultrathin flat surfaces. We have shown that when the gain supplied by the active medium embedded within a quasi-2D active metamaterial is sufficient to overcome dissipative and radiative losses, the structure can indeed function as a coherent emitter of surface plasmons over the whole ultrathin 2D area, well below the diffraction limit for visible light. Both, bright and dark plasmonic lasing states can be generated, coupling either strongly or weakly to the continuum. Which one eventually dominates can be controlled by the design of the metametaterial. The dynamic, nonlinear competition between such lasing states is illustrated in Figure 3(c) where one may discern the initial build-up of the bright-mode energy (external and internal; red), followed by the damped-amplitude, ps-period relaxation oscillations, and then steady-state emission that is interrupted (at around 50 ps) by the instability of the dark mode (only internal; yellow) until again steady-state emission is reached. Stopped-light plasmonic nanostructures, together with gain-enhanced optical metamaterials, constitute an exciting new frontier in nano-photonics and nano-science, and are precursors towards active, integrated quantum nano-optics. Reaching the full-light-stopping regime and bringing gain at the nanoscale is anticipated to improve the performance of a host of active nano-components, such as electro-optic modulators and light sources, but also passive ones, such as plasmonic waveguides or sensors featuring intensified plasmonic hotspots for single-emitter spectroscopy. Robert W. Boyd, Daniel J. Gauthier, "Slow and fast light". Progress in Optics, 43, 497–530 (2002). Abstract. Léon Brillouin, "Wave Propagation and Group Velocity" (Academic, 1960). P. W. Milonni, "Fast Light, Slow Light, and Left-Handed Light" (Institute of Physics, 2005). O. Hess, J. B. Pendry, S. A. Maier, R. F. Oulton, J. M. Hamm, K. L. Tsakmakidis, "Active nanoplasmonic metamaterials". Nature Materials, 11, 573–584 (2012). Abstract. Sebastian Wuestner, Joachim M. Hamm, Andreas Pusch, Fabian Renn, Kosmas L. Tsakmakidis, Ortwin Hess, "Control and dynamic competition of bright and dark lasing states in active nanoplasmonic metamaterials". Physical Review, B 85, 201406 (R) (2012). Abstract. Alexandre Aubry, Dang Yuan Lei, Antonio I. Fernández-Domínguez, Yannick Sonnefraud, Stefan A. Maier, J. B. Pendry, "Plasmonic light-harvesting devices over the whole visible spectrum". Nano Letters, 10, 2574–2579 (2010). Abstract. Min Seok Jang, Harry Atwater, "Plasmonic rainbow trapping structures for light localization and spectrum splitting". Physical Review Letters, 107, 207401 (2011). Abstract. 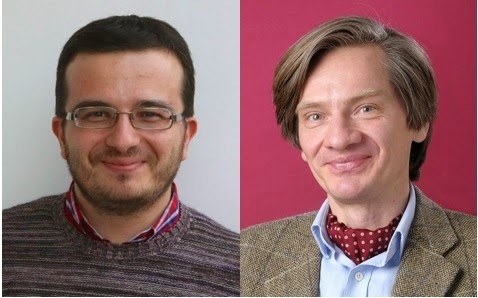 Zubin Jacob, Vladimir M. Shalaev, "Plasmonics goes quantum". Science 334, 463‒464 (2011). Abstract. Na Liu, Mario Hentschel, Thomas Weiss, A. Paul Alivisatos, Harald Giessen, "Three-dimensional plasmon ruler". Science 332, 1407‒1410 (2011). Abstract. Lene Vestergaard Hau, S. E. Harris, Zachary Dutton, Cyrus H. Behroozi, "Light speed reduction to 17 metres per second in an ultracold atomic gas". Nature 397, 594–598 (1999). Abstract. Shuang Zhang, Dentcho A. Genov, Yuan Wang, Ming Liu, Xiang Zhang, "Plasmon-induced transparency in metamaterials". Physical Review Letters, 101, 047401 (2008). Abstract. N. Papasimakis, V. A. Fedotov, N. I. Zheludev, S. L. Prosvirnin, "Metamaterial analog of electromagnetically induced transparency". Physical Review Letters, 101, 253903 (2008). Abstract. M. D. Lukin, A. Imamoğlu, "Controlling photons using electromagnetically induced transparency". Nature, 413, 273–276 (2001). Abstract. Chien Liu, Zachary Dutton, Cyrus H. Behroozi, Lene Vestergaard Hau, "Observation of coherent optical information storage in an atomic medium using halted light pulses". Nature, 409, 490–493 (2001). Abstract. Toshihiko Baba, "Slow light in photonic crystals". Nature Photonics, 2, 465–473 (2008). Abstract. Shayan Mookherjea, Andrew Oh, "Effect of disorder on slow light velocity in optical slow-wave structures". Optics Letters, 32, 289–291 (2007). Abstract. R. J. P. Engelen, D. Mori, T. Baba, L. Kuipers, "Two regimes of slow-light losses revealed by adiabatic reduction of group velocity". Physical Review Letters, 101, 103901 (2008). Abstract. Tie Jun Cui, David Smith, Ruopeng Liu (Editors), "Metamaterials: Theory, Design, and Applications" (Springer, 2009). Edmund I. Kirby, Joachim M. Hamm, Tim W. Pickering, Kosmas L. Tsakmakidis, Ortwin Hess, "Evanescent gain for slow and stopped light in negative refractive index heterostructures". Physical Review B, 84, 041103(R) (2011). Abstract. Kosmas L. Tsakmakidis, Tim W. Pickering, Joachim M. Hamm, A. Freddie Page, Ortwin Hess, "Completely stopped and dispersionless light in plasmonic waveguides". Physical Review Letters, 112, 167401 (2014). Abstract. Alexandra Boltasseva, Harry A. Atwater, "Low-Loss Plasmonic Metamaterials". Science, 331, 290‒291 (2011). Abstract. 2Physics Article. Kosmas L. Tsakmakidis, Allan D. Boardman, Ortwin Hess, " ‘Trapped rainbow’ storage of light in metamaterials". Nature, 450, 397–401 (2007). Abstract. J. B. Pendry, "A chiral route to negative refraction". Science, 306, 1353‒1355 (2004). Abstract. Alexandre Archambault, Mondher Besbes, and Jean-Jacques Greffet, "Superlens in the time-domain". Physical Review Letters, 109, 097405 (2012). Abstract. Dennis M. Callahan, Jeremy N. Munday, Harry A. Atwater, "Solar cell light trapping beyond the ray optic limit". Nano Letters, 12, 214 (2012). Abstract.